Bosses at fashion chain Superdry have told co-founder Julian Dunkerton he is not wanted back at the firm. The company is holding a shareholder meeting at the start of next month to decide whether to grant Mr Dunkerton's request to return as a director. But Superdry said such a move would be "extremely damaging". Mr Dunkerton left the firm last year and has been critical of the firm's strategy since then. He wants the firm to focus on selling hoodies and coats. He also disputes the firm's claim that he oversaw the Autumn/Winter collection which did not sell well. Mr Dunkerton says he was cut out of the design process for many months before he left. Superdry became popular with teenagers by providing sweatshirts and other casual wear with a Japanese-style branding. 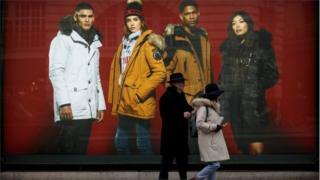 Mr Dunkerton favours sticking with Superdry's trademark hoodies and jackets, but fashion watchers say this market is now saturated. Mr Dunkerton told the BBC late last year he was offering to return to Superdry "in any capacity" to correct what he described as a failing strategy. He argued that the policy of putting new products in its stores more frequently was not working. Mr Dunkerton co-founded the fashion chain in 2003 and is still Superdry's largest shareholder, with an 18.4% stake. He founded the firm with James Holder, who resigned from the business in 2016, and who has a 9.7% stake. The company's current management, which is being led by chief executive Euan Sutherland, have been in dispute with Mr Dunkerton for months over strategy. Superdry said in its statement: "The board unanimously believes that Mr Dunkerton's return to the company, in any capacity, would be extremely damaging to the company and its prospects." It said Mr Dunkerton's strategy would reintroduce a leadership style that does not fit within the "open-minded collaborative culture, values and operation of the company". In December it issued a profits warning, saying it would make between £55m and £70m this year, well down on the £84m the market was expecting. Last week, Superdry said it would cut up to 200 jobs at its head office as part of a £50m cost-cutting plan. Its shares have lost more than 70% over the past year.